The environments of Earth include conditions in which physical and chemical extremes make it very difficult for organisms to survive. Conditions that can destroy living cells and biomolecules include high and low temperatures; low amounts of oxygen and water; and high levels of salinity, acidity, alkalinity, and radiation. Examples of extreme environments on Earth are hot geysers and oceanic thermal vents, Antarctic sea ice, and oxygen-depleted rivers and lakes. Organisms that have evolved special adaptations that permit them to live in extreme conditions are called "extremophiles." Some organisms survive in extreme environments by keeping the extreme environment outside their cell walls. For example, organisms that live at the extremes of pH are often able to do so by maintaining their cytoplasm at near-neutral levels of pH, thus eliminating the need for other adaptive physiology. Where it is impossible to keep the extreme environmental conditions outside the cells, in very hot environments, for example, extremeophiles have evolved special physiological mechanisms and repair abilities. High temperatures increase the fluidity of membranes, whereas low temperatures decrease membrane fluidity. To counter these changes, some extremeophile organisms change the ration of unsaturated to saturated fatty acids. As temperatures decrease, the proportion of unsaturated fatty acids in the membrane increases. The increase in the proportion of unsaturated fatty acids is also often a response to increased pressure, which also reduces the fluidity of cell membranes. To withstand below-freezing temperatures, some organisms protect cell fluids from freezing by producing chemicals that act like antifreeze, lowering the temperature at which the cell fluids will freeze (crystallize) to as low as -40 degrees Celsius. Other organisms are freeze tolerant, permitting freezing of up to 65 percent of their body water, as in the case of the wood frog. A hydrothermal vent on the East Pacific Rise. Life forms ranging from microbes to invertebrates have adapted to the extreme conditions around these underwater geysers. High temperatures destroy the delicate proteins of unadapted organisms. Extremeophiles have protein structures stabilized against the disruptive effects of heat. One Archean thermophile, Thermus aquaticus, which lives in hot springs, is the source of the heat-stable deoxyribonucleic acid (DNA) polymerase enzyme used in polymerase chain reaction (PCR). PCR forms part of the foundation of much of the biotechnology industry. Radiation and oxidative damage have always been common on Earth. Mechanisms evolved to cope with these conditions include the production of antioxidants and detoxifying enzymes and the ability to repair damage to cells. Many microorganisms respond to increases in osmolarity (concentration of dissolved substances in the environment) by accumulating osmotica ( ions , amino acids , or other small molecules) in their cytosol to protect them from dehydration and desiccation . With the exception of the Halobacteriaceae, which use K t (potassium ion) as their osmoticum, glycine-betaine is the most common effective osmoticum in most prokaryotes . During desiccation, osmotic concentration increases, and thus responses are similar to those in a cell in a saline environment. Deep Sea. The deep sea environment has high pressure and cold temperatures (1 to 2 degrees Celsius [33.8 to 35.6 degrees Fahrenheit]), except in the vicinity of hydrothermal vents, which are a part of the sea floor that is spreading, creating cracks in the earth's crust that release heat and chemicals into the deep sea environment and create underwater geysers. In these vents, the temperature may be as high as 400 degrees Celsius (752 degrees Fahrenheit), but water remains liquid owing to the high pressure. 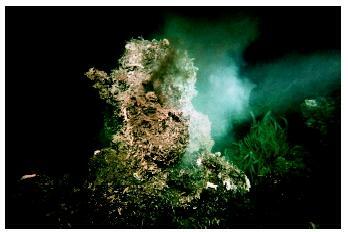 Hydrothermal vents have a pH range from about 3 to 8 and unusual chemistry. In 1977, the submarine Alvin found life 2.6 kilometers (1.6 miles) deep near vents along the East Pacific Rise. Life forms ranged from microbes to invertebrates that were adapted to these extreme conditions. Deep sea environments are home to psychrophiles (organisms that like cold temperatures), hyperthermophiles (organisms that like very high temperatures), and piezophiles (organisms adapted to high pressures). Hypersaline Environments. Hypersaline environments are high in salt concentration and include salt flats, evaporation ponds, natural lakes (for example, Great Salt Lake), and deep sea hypersaline basins. Communities living in these environments are often dominated by halophilic (salt-loving) organisms, including bacteria, algae, diatoms, and protozoa. There are also halophilic yeasts and other fungi, but these normally cannot tolerate environments as saline as other taxa. Deserts. Deserts can be hot or cold, but they are always dry. The Atacoma desert in Chile is one of the oldest, driest hot deserts, sometimes existing for decades without any precipitation at all. The coldest, driest places are the Antarctic Dry Valleys, where primary inhabitants are cyanobacteria, algae, and fungi that live a few millimeters beneath the sandstone rock surface. Although these endolithic (living in rocks) communities are based on photosynthesis, the organisms have had to adapt to long periods of darkness and extremely dry conditions. Light dustings of snow that may melt in the Antarctic summer are often the only sources of water for these organisms. Ice, Permafrost, and Snow. From high-altitude glaciers, often colored pink from red-colored algae, to the polar permafrost, life has evolved to use frozen water as a habitat. In some instances, the organisms, such as bacteria, protozoa, and algae, are actually living in liquid brine (very salty water) that is contained in pockets of the ice. In other cases, microorganisms found living on or in ice are not so much ice lovers as much as ice survivors. These organisms may have been trapped in the ice and simply possessed sufficient adaptations to enable them to persist. Atmosphere. The ability for an organism to survive in the atmosphere depends greatly on its ability to withstand desiccation and exposure to ultraviolet radiation. Although microorganisms can be found in the upper layers of the atmosphere, it is unclear whether these constitute a functional ecosystem or simply an aerial suspension of live but largely inactive organisms and their spores. Outer Space. The study of extremeophiles and the ability of some to survive exposure to the conditions of outer space has raised the possibility that life might be found elsewhere in the universe and the possibility that simple life forms may be capable of traveling through space, for example from one planet to another. Madigan, M. T., and B. L. Marrs. "Extremophiles." Scientific American 276, no. 4 (1997): 82–87. Rothschild, L. J., and R. L. Mancinelli. "Life in Extreme Environments." Nature 409 (2001): 1092–1101. Seckbach, J., ed. Journey to Diverse Microbial Worlds: Adaptation to Exotic Environments. Dordrecht, Netherlands: Kluwer Academic Publishers, 2000.